eD@HoMe: Many covers to share! Trust you guys are well! Here I have many awesome covers to share! My first cover from Venezuela! Many thanks to Jesus Moret Y Ferrer! The lovely stamps are from the "Bicentennial Independence of Venezuela" series, issued in 2009. Next is a wonderful cover posted from Vancouver, Canada! Courtesy of Kang Wei Xie! 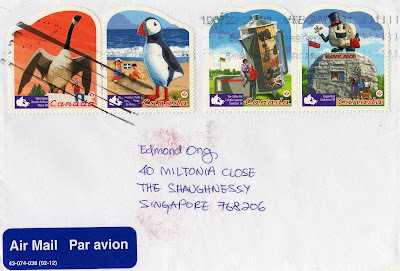 The set of 4 beautiful stamps belongs to the "Roadside Attractions" series, issued on 05th July 2010. Once again many thanks to Koh Kok Keong for yet another beautiful FDC from Malaysia! 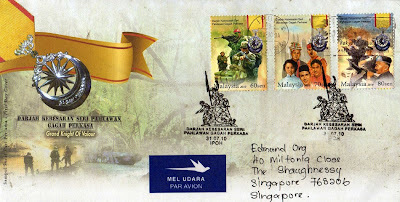 Released on 31 July 2010, the cover features stamps from the "Grand Knight of Valour" series. A lovely cover posted from USA! This time from Buck Creek, Indiana. Thank you very much, Tim Schenpp! 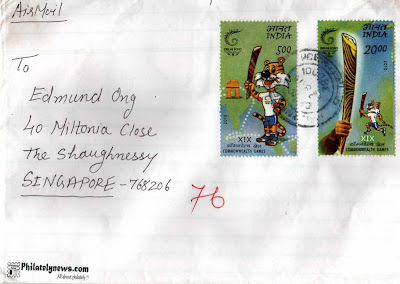 Yes, I would send you a cover from Singapore soon! 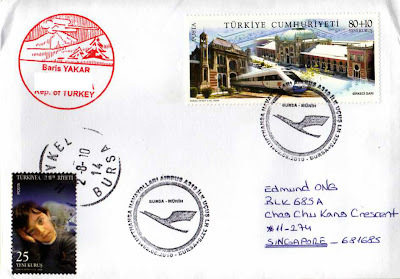 Posted on 02 August 2010 in Bursa, Turkey, this gorgeous cover bears stamps from the "Railway Station Buildings" and "World Environment Day" series. 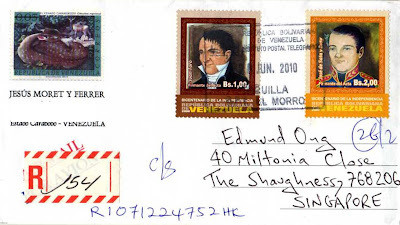 They were issued on 15 October 2008 and 05 June 2008 respectively. Many thanks to Baris Yakar! Last but not least is an awesome cover posted from Gujarat, India! Great thanks to Shrikant Modh! The stamps belong to the "XIX Commonwealth Games" series. The Games are scheduled to be held in Delhi, India between 3 October and 14 October 2010. It will be the first time that the Commonwealth Games is going to be held in India and the second time the event has been held in Asia (after 1998 in Kuala Lumpur, Malaysia). That's all folks! Have a great weekend! Latest Youth Olympic Games Stamps!